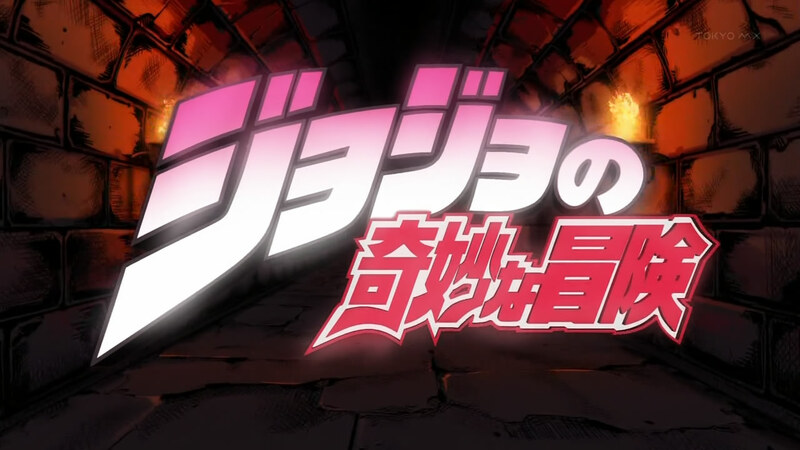 JoJo’s Bizarre Adventure – Crimson Otaku's Anime Blog. I’ve always been a fan of melodramatic, over the top anime like “Tengen Toppa Gurren Lagann” and a few shounen series and I heard some good things about the series from people i knew so I felt that this series was right up my alley. “JoJo’s Bizarre Adventure” follows the misadventures of the Joestar family through the many generations of the family, following the descendant of that time. The manga series that the series was adapted from so far has eight arcs. 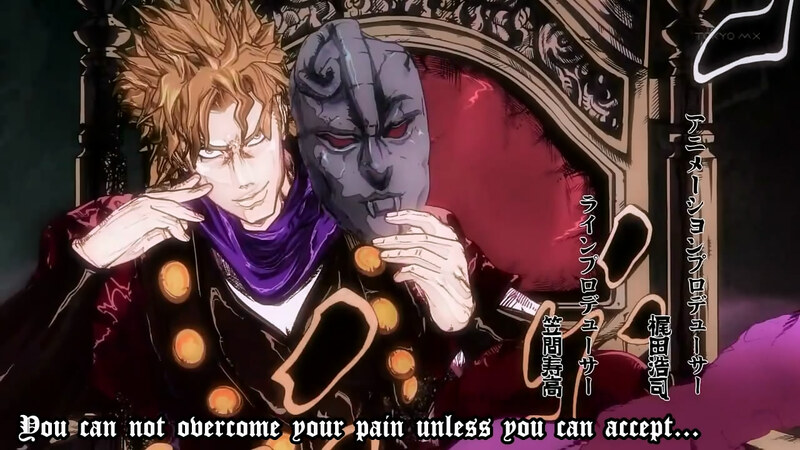 This adaptation of the anime follows the first two arcs; Phantom blood and Battle tendency. The first arc is set in late 19th century Britain where the young Johnathan Joestar meets his new adopted brother Dio Brando who only wants to usurp Jonathan as heir to the Joestar family. However, his attempts are thwarted and when he resorts to using an ancient stone mask, it transforms him into a vampire. From that day onward’s Johnathan must learn the ways of “Hamon” (or “Ripple”… yeah, great name!) 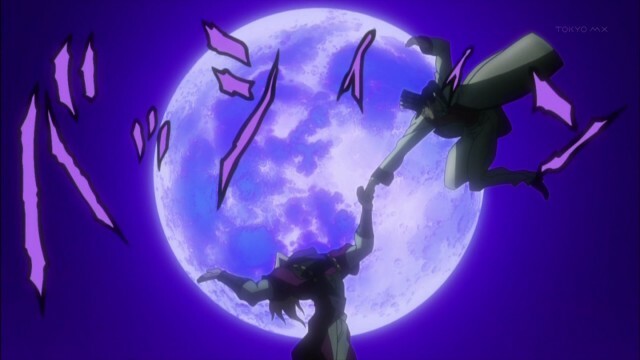 from Will Zeppeli and former street thug, Robert Speedwagon to defeat Dio and stop him from taking over the world. 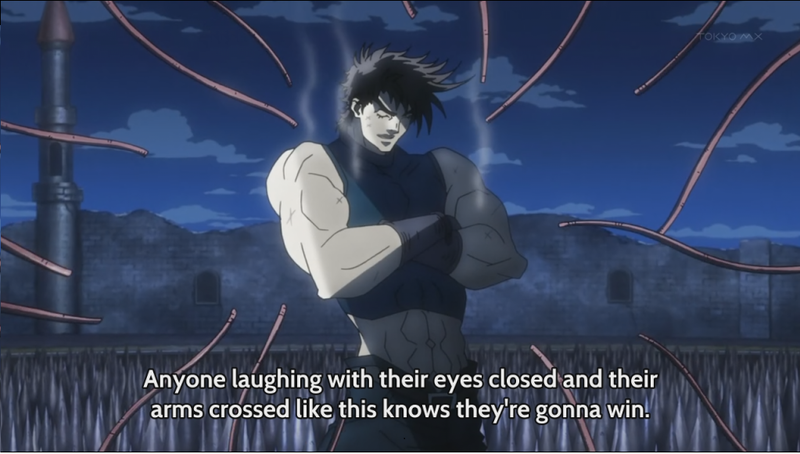 The next arc is set in 1930’s america where the grandson of Jonathan, Joseph finds that Speedwagon has diasappeared and upon looking for him he discovers a much more powerful enemy named “The Pillar Men” and he to must learn to master “The Ripple” from Lisa Lisa to defeat the pillar men and defend the world. so from my brief description of the plot you can probably tell that the plot is not the strongest part of the series as it follows the cliché plot-line of saving the world from the bad guys will vague motives by beating the ever-loving crap out of them. so i would not call this a high point but the series does set up strong foundation with the story so it the series as a whole does not feel generic. The fighting is also a spectacle to behold. It’s over the top, melodramatic and awesome. 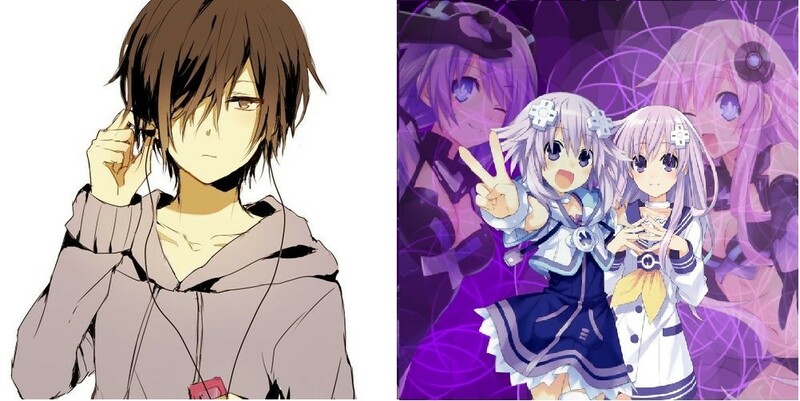 it’s fast paced, its full of lighting effects and filters and sometimes the fights a psychological with the main protagonist and their opponent reading each others moves making some fights unpredictable. they also added the kanji effects that would be on the pages of the manga and used backgrounds similar to background on manga frames which is a touch that I liked as it made it feel more dramatic and it emphasis movements on-screen but this a very stylized touch that some may appreciate or may put others of. I also liked the art that the series had mainly because the looked very typical of an 80’s manga which i liked and the colors used added to the overall mood of many scenes or they could appear to be very overwhelming but this may be something that appeals to you. I would like to add how “Ripple” is a very cool power but they vaguely explained what it can actually do with the exception of killing vampires, and it seems like they can do the most ridiculous things with it. for example ripple users have managed to push venom out of their body, walk on water, throw bubbles which can cut through vampires, create hang-gliders from leaves and many other ridiculous things with the most vague explanation. This series does truly test your suspension of disbelief to its limit. the final point that i would like to make is the soundtrack which is very good, with many tracks adding to the overall feel to the anime by making scenes seem much more dramatic or getting you pumped for a fight. Another area that must be pointed out is the openings which look brilliant in my opinion as they both sum up the overall feel of 80’s shounen with a great song for both openings and a good representation of whats in store. The only bad thing about these openings is that the CG in the openings are an eye sore but it’s not so evident in the second opening as the CG is used much less and in combination with the many bright colors it is less noticeable. My final verdict for the series is that i will highly recommend this if you are just looking for something fun that you don’t have to take seriously and you don’t want a deep and complex story line. my recommendations for other anime like this would be “Tengen Toppa Gurren Lagann” as the anime has the same over the top feel to it and there both just fun series to watch that you don’t need to take seriously although i would say Gurren Lagann is much better but that is mainly personal preference. I have decided to rate this anime 7.5/10. Thank you for reading this first review of mine and i hope you have enjoyed it as much as i have. thank you again and ill see you next post.